What: Each year the pros in our sport vote for the Number One Rider in each of the following categories: street, ramp, dirt, flat, race, and best video part. At the huge party, the award winners are presented a big, shiny cup and a year's worth of bragging rights. There is an open bar, special guests, and lots of other entertainment lined up. Basically this is the biggest party in BMX and you need to be there. 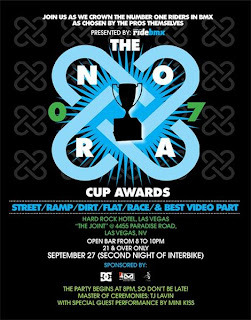 Who: NORA cup is open to the public, but since the party is in a bar in a casino, it is a 21 and over event. Everyone who is anyone in BMX will be there—industry professionals and riders alike. TJ Lavin will be the host of the awards and there will be several historic and influential presenters, so get ready for a great show. After the awards are handed out there will be a special performance by Mini Kiss, a Kiss cover band comprised entirely of "little people"! When: Thursday, September 27, 2007. This is the 2nd night of Interbike. There is an open bar from 8 to 10pm, followed by the awards show. The party ends when it ends...and in Vegas, the party never ends! Damn it!!! I wish I was going...maybe next time.